There are several resorts scattered around the village of Mojstrana which also has one run of its own. This is served by a T Bar and is only a 2 minute walk from the house. There is also a bar and an ice rink at the bottom of the run. It's floodlit at night. However, the following are our favourites although this list is by no means exhaustive. There are also some Nordic skiing routes. Off piste skiing is available from Dovska Baba but you will need a guide. Situated 20 minutes away from the house, this enchanting and picturesque village nestles against the foothills of the magnificent Julian Alps, just a few miles from the Italian and Austrian borders. Kranjska Gora is a classic alpine resort and a great place for beginners and families. It is the most sophisticated resort in Slovenia and has 10 mountain restaurants. Snow cannons are everywhere and the resort regularly hosts the FIS Men's Giant Slalom World Cup races at Podkoren and Ski Jumping at Planica. The resort has 30 kms of pistes and 20 lifts. The nursery slopes at Podkoren are less busy than those at Kranjska Gora. It is an excellent place for beginners. 20 minutes up from the industrial town of Jesenice you will find a hidden gem. The ski slope is one of my favourites which is surprising given that it has one fairly violent single seat chair lift that will take your legs off if you are not careful, only two runs and no snow cannons. However, the views over the Julian Alps are stunning! Go for the views! Situated 30 minutes away from the house is the a national centre for cross country skiing and biathlon, Pokljuka provides a network of routes for skiers. It also has some very quiet downhill nursery slopes. Just 30 minutes away, through the Karavanken tunnel into Austria and close to the city of Villach, is the resort of Gerlitzen. Park at Annenheim and take the gondala up. This is a great intermediate resort with a fabulous long red down to Klosterle. Again 30 minutes should see you parking up under the Monte Lussari gondola. This resort hosts the FIS World Cup Women’s downhill and whilst it’s not a big result there are some long and challenging reds and blacks with a few blues at the top at Tarvisio. The monastery at the top of the mountain is also worth a look and ‘Juries restaurant’ is good for Pasta (Try the Triste). Over the mountain pass from Kranjska Gora near the Austrian town of Arnoldstein, is this interesting small resort sporting mostly reds and blacks. It’s interesting in that at the top you can play country twister as the boarders of Slovenia, Italy and Austria Converge here. Indeed in September there is a massive celebration held in this very spot with live bands from all three countries competing for your attention. However, in September you have to walk up and at least in the winter you can take the chair! Lying 40 minutes from the house in the direction of Bled and above that lake of Bohinj, his beautiful region is also framed by the majestic Julian Alps and is one of the most picturesque and unspoilt skiing regions in the world. Ideal for those seeking tranquillity on or off the pistes. It has 60 kms of runs and 17 lifts. Vogel is excellent after a huge dump of the fresh stuff as most of the resort is contained in a bowl. This resort is also only 40 minutes from the house. A Gondola takes you to an altitude of 1450 to 1971 metres above sea level. It offers more than 25 kilometres of excellent pisted runs. There are 12 lifts. This was voted as one of the top weekend break skiing resorts so best to go mid-week! Best approached via Tarvisio and Pontebba on the Italian side so that you can park at the top, this resort is extensive and offers some fantastic skiing both on and off the slopes. It’s one of my favourites but there aren’t a lot of blue runs however, great if you want to step up to reds. Allow an hour to get there. One hour away from the house, this is a large sophisticated Spa town and Skiing resort. It’s also the home of Franz Klammer who has a run named after him and who I had the privilege to ski with a few years ago. You may even see him if you visit the bar under the Kaiserbahn lift. This resort will appeal to everyone and after a hard day, you can even go and relax in the thermal baths. Beginners and snowboard park enthusiasts should head for the Nockalm lift. Fifteen minutes on from Bad Klein is this picturesque resort which as well as an excellent series of runs has a massive snow board park and a ski cross circuit (Great fun but not for the fainthearted). A tractor pulls you to either half of the resort across a frozen lake. There is also a fantastic summer/winter toboggan which is a bit of a hoot! 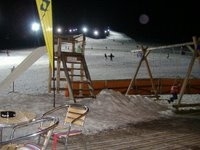 Situated a fast 1 1/4 hours from the house up the Salzburg motorway is this fabulous ski area. Turn off after the taurn tunnel and park at the new gondola in St Michael. As well as the runs themselves which cater for all abilities, there are some superb ski touring routes. Coming off the motorway one junction before the turn off for St Michael is the impressive resort of Katschberg. This resort has two sides but the Ainek side (which is on the opposite side of the valley to St Michael) is far the more impressive boasting a superb range of runs including the fabulous A1 which goes on for miles right down to the valley floor in St Margarethen where you can get a bus to St Michael if you still have any energy left that is! Allow 1 ¼ hours. If that isn’t enough try Goldeck, Flashau, Flattach, Helingblut and Bad Gastein!